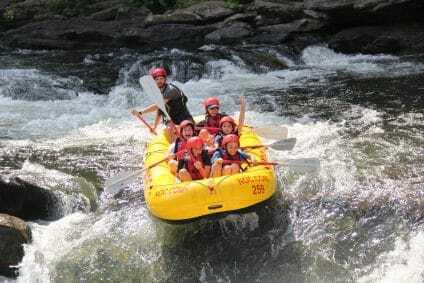 Since 1978, schools from the eastern U.S. have been bringing 6th- to 12th-grade classes to the stunning classroom setting of the Blue Ridge Mountains for 3- to 8-day outdoor education programs. We offer four different program styles so your school can choose the type of activities that will most benefit your students. No matter which program your school chooses, we provide students with a growth-filled outdoor experience focused on safety, leadership, class unity, and natural science. The Adventure Treks school experience is often the highlight of a student’s formal educational experience. Safety is our primary concern, and we are extremely proud of our outstanding safety record. All of our instructors have Wilderness First Responders medical certifications and have participated in our extensive training program and orientation. We work closely with teachers and administrators to create fun, community-building, and growth-oriented educational experiences for students. The outdoors is the perfect place to augment classroom curricula, invigorate students’ sense of curiosity and discovery, and make lasting impressions that are often the pinnacle of the school year. Adventure Treks’ programs are heavily influenced by the framework set forth by the Partnership for 21st Century Skills: students are challenged to master communication, problem-solving, creativity, and collaborative skills among other abilities essential to success in the modern world. Let us know what you would like to see students accomplish during your experience with us, and we’ll incorporate appropriate activities and facilitation. Knowing that we all have more fun and success when we feel included, valued, and supported, we put a lot of energy into the intentional development of community. As soon as students arrive, they are divided into small groups which are developed by teachers in order to promote positive social dynamics. Our instructors facilitate games, activities, and discussions that foster the development of a close, caring community. After a week of supporting each other, you can expect your classes to return to school more united and energized. We offer 4 program styles* designed to ignite students’ wonder in the natural world, cultivate inclusive communities, encourage critical thinking, strengthen communication, and help prepare students for success in the 21st century. You can base out of Camp Pinnacle in Flat Rock, NC, or in nearby Pisgah National Forest. Before your adventure begins, your students will be divided into small groups consisting of 10–12 classmates, a teacher from your school, and two Adventure Treks Instructors**. During your adventure, Adventure Treks provides all instruction, logistics, outdoor equipment, and meals. *Contact us to design a custom program that works within your school’s curriculum and budget. **Southern Appalachian Science Center is facilitated with 1 Instructor per group. In 2002, the U.S. Department of Education formed a coalition with leading education experts and industry leaders (such as Apple, Microsoft, Cisco Systems, Dell, and the National Education Association) to create a comprehensive set of skills that are essential for success in the 21st century. The Partnership for 21st Century Skills formed, and they created an essential skills list called the “4 Cs” which include, critical thinking and problem-solving; communication; collaboration; and creativity and innovation. These learning goals are the focus of this program. We aim to assist schools in reaching their stated mission of preparing students for the 21st century by effectively teaching these skills to students and giving them real-life experience to draw on as they continue their education back in the classroom. Upon arrival to Camp Pinnacle in Flat Rock, NC, students are split into teams of 10–12 classmates and a teacher from your school. In these teams, students will be presented with fun, timed challenges designed to require the effective use of the “4 Cs.” Each activity is facilitated and debriefed by one of our trained instructors focused on encouraging group growth and individual awareness. This program can be facilitated over three or four days. Accommodations: Students and teachers sleep in cabins at Camp Pinnacle and spend one night in a tent on camp property. Your students will base out of a group camp-site in historic Pisgah National Forest. Students, teachers, and instructors will spend the next 4–5 days pursuing exciting adventure activities in the natural world. Our instructors facilitate games, activities, and discussions that foster the development of a caring community. Throughout the week students are encouraged to learn new outdoor skills, take on an appropriate level of leadership, practice positive and effective communication, and have tons of fun! Your students will learn outdoor skills, hike through some of the most beautiful scenery in the country, discover the flora and fauna of the forest ecosystem, and so much more. While immersed in nature’s classroom, students will be learning other valuable lessons too: practicing communication through our daily “evening circle”; critical thinking as “leader of the day”; collaboration while setting up camp and cooking meals; problem-solving through fun team-building games; and kindness while forming a close-knit community. Safety is our first priority, and our instructors focus on instilling a mindset of safety in students from day one by role modeling safe behavior and teaching risk management in conjunction with each activity. Accommodations: Students and teachers sleep in tents in Pisgah National Forest. Typically geared for students in 8th to 12th grades, this program features a slightly higher level of challenge than our Outdoor Adventure program. The Backcountry Immersion provides students the opportunity to spend 3 to 5 days learning how to backcountry camp and travel. Upon arrival to Pisgah National Forest, your students will learn about the equipment they will use, how to pack everything they need for the next 3 to 5 days into their Adventure Treks–provided backpacks, and how to backpack. Your students will learn outdoor skills, hike through some of the most beautiful scenery in the country, discover the flora and fauna of the forest ecosystem, and much more. While immersed in nature’s classroom, students will be learning other valuable lessons too: practicing communication through our daily “evening circle”; critical thinking as “leader of the day”; collaboration while setting up camp and cooking meals; problem-solving through fun team-building games; and kindness while forming a close-knit community. Safety is our first priority, and our instructors focus on instilling a mindset of safety in students from day one by role modeling safe behavior and teaching risk management in conjunction with each activity. Adventure Treks operates the Southern Appalachian Science Center at Camp Pinnacle in Flat Rock, NC. We blend hands-on science activities with community-building and adventure activities for an exceptional educational experience. Students explore watersheds from a canoe, peer at aquatic species collected from a cascading stream under a microscope, and study the night sky in some of the best star-gazing country in the southeast. Our classes are designed to weave experiential learning and science instruction for students to more effectively retain the information they are learning in your school’s science classes. Rock climbing, ziplining, swimming in our lake, and riding the waterslide will make this trip as fun as it is educational. Accommodations: Students and teachers sleep in cabins at Camp Pinnacle. Students arrive and leave from Pisgah Center for Wildlife Education, located in Pisgah National Forest, NC, or from Camp Pinnacle in Flat Rock, NC. In short, delicious! Although food is cooked on camp stoves instead of in a traditional kitchen, the food we eat is the same as you eat at home. Meals include breakfast burritos, a sandwich bar, pasta salad, macaroni and cheese, stir fry, chili and quesadillas. Students love learning how to cook for themselves, and parents love it when students come home ready to cook a meal for them! Food for the Southern Appalachian Science Center program is cooked by staff, not students, in our camp kitchen and enjoyed buffet-style. We are extremely proud of our Adventure Treks instructors, but, more important, students love them! They are all outdoor education professionals with solid outdoor experience and college degrees (several have advanced or multiple degrees); many are returning for a second, third, or fourth season. Risk management is our number-one priority, and all of our instructors are certified as Wilderness First Responders, EMTs, or Wilderness EMTs. Again, safety is our first priority and no matter which trip your student attends, an instructor will be close by each night. Whether a student gets sick, homesick, or is simply having trouble adjusting, instructors are well-trained and ready to address any problem that should arise with empathy and professionalism. Students will typically not have cell phones during their adventure. Parents should be advised that due to the wilderness nature of some programs, our groups are not always in cell phone service. In an emergency, please contact your school. The school will be able to contact our office to relay the message to your child in the field. We also have a 24-hour emergency line in case your school contacts us after hours. We are more than happy to answer any questions you or your student has about your trip. Please call our office at (828) 698-0399.